It was billed as a Super Sunday and for once the billing didn't disappoint as the Dublin Senior 'A' Hurling Championship semi-finals offered wonderful and intense fare in Parnell Park. By the end of an enthralling afternoon, the bare facts show that Ballyboden St Enda's and Kilmacud Crokes will contest the 2018 decider on Sunday week but those bare facts only partially tell the story of a day that highlighted the quality and competitive nature that has become a hallmark of this championship in recent years. 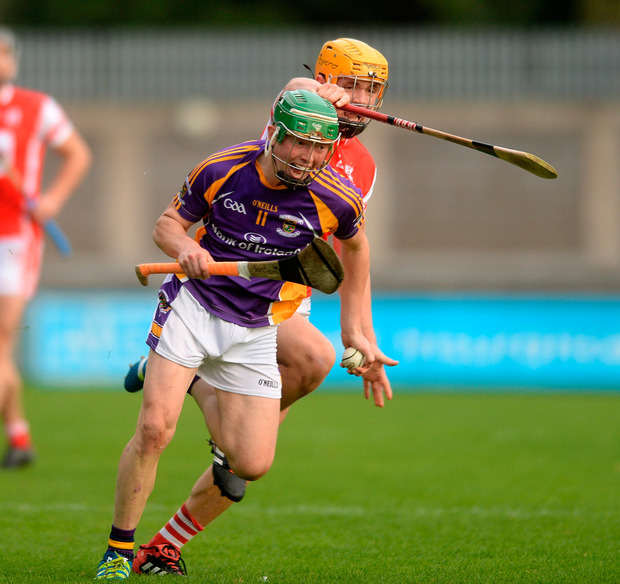 Without taking anything away from Kilmacud, who thoroughly deserved their win over Cuala, there was an element of sadness about the result given all that Cuala have given Dublin hurling over the past three years. However, they succumbed in possibly the best manner possible, displaying that stubbornness in refusing to accept their fate despite all the odds being stacked against them. With Paul Schutte already absent to injury, the wrist injury suffered by Darragh O'Connell was another serious blow for the holders and Damien Kelly's wonderful goal within 20 seconds of the restart looked fatal in terms of their chances. However, slowly but surely, they dragged themselves back into contention and while the end result went against them, the lasting impression was of a team that still has plenty more to offer and that will refuse to go quietly into the night. Earlier in the afternoon, Ballyboden St Enda's made a welcome return to the final for the first time in five years as they edged St Vincent's by four points in another match that went right down to the wire. Boden struggled to stamp any kind of authority on the game in the first half but the more the contest evolved, the more assured they became, with St Enda's manager Joe Fortune a relieved figure by the final whistle. "If you were looking at it from an outsider's perspective, St Vincent's during the year have improved from their first game. "They are a serious group of young hurlers with the likes of (Conor) Burke and (Rian) McBride and I'm very fond of an awful lot of them. "Some of them have been involved with me in big games down the years with Dublin. "St Vincent's threw the kitchen sink at us and I thought that we had a poor first half. "I thought that we came out much better in the second half and there were perhaps, a couple of harsh words at half-time about how much they really wanted to be back again in the final. "But, I have to take my hat off to Vincent's who pushed us all the way and I'm not sure that we have faced a massive challenge this year up until Sunday. "I suppose the big break between April and September has made it hard to manage between lads going on holidays and the others playing with their counties. "I can only commend St Vincent's today as we just about made it over the line. "We are under no illusions that we have an awful lot of work to do but we are in the final now and if you had offered me that at the start of the year, I would have bitten your arm off," he said. "We spoke about our display in a fairly dogmatic manner at the break on the basis that you have thirty minutes to decide if you want to try to get back at the top again. "The first half suited Vinnies in some sense in terms of the space in front of them and their movement was incredible and maybe it was just a little bit of advice over the year from the back-room team that we had to shut down their middle and half-back line. "I'm very proud of my own lads and the effort that they put in but having said that, we still made a massive amount of mistakes so we have lots to work on ahead of the final. Fortune has made a hugely positive impression since his arrival on the Firhouse Road, taking over a panel that had underachieved to a degree in the past few seasons. The squad was perceived as being weighted maybe too high on experience and perhaps lacking in youth and finding that right balance has been Fortune's main focus this year. On Sunday, that balance seemed well-aligned with Shane Durkin and Gary Maguire, more than most, offering that leadership while Aidan Mellett proved their match-winner up front with a terrific display that yielded 1-3 from play. "I'm just delighted for Ballyboden and they have made me feel so welcome since the start of the year. "We're in a county final now and it's the biggest day of the club calendar and we'll have some battle ahead of us on Sunday week to try to get over Crokes but we're in with a chance now. "If you look at the first half against Ballinteer St John's in the quarter-final, Conal (Keaney) and Paul (Ryan) were the lads doing the bulk of the scoring but we knew that Vinnies were good enough to itemise our two biggest threats and main forwards and they managed to do that. "Our talk all year has been why do we have to stop when the county lads come back into the team? "There are lads in Ballyboden that are plenty good enough to take over the mantle from these lads in a couple of years. "Some people may doubt that there is youth coming up through the club but I can assure you that it is there and some of it stood up a bit on Sunday. "Having said that, we'll still need Keaney and Ryan to be at their best on Sunday week if we are to have any chance of winning the final," he added.